I just submitted my second WordPress core patch that adds a short-circuit filter at the top of wp_nav_menu which enables plugins to retrieve rendered menu output from a transient or non-persistent cache instead of relying on relatively complex database query that returns one of the most static items of every website. Retrieve term object of the nav_menu taxonomy that corresponds to the specific menu name. Retrieve menu item IDs (not complete post objects, yet) that are in the particular term. Query for menu item post objects with the specific IDs and retrieve three post_meta values per each menu item. Retrieve post and term objects corresponding to each menu item (map every nav_menu_item post to the actual post, page or archive page). 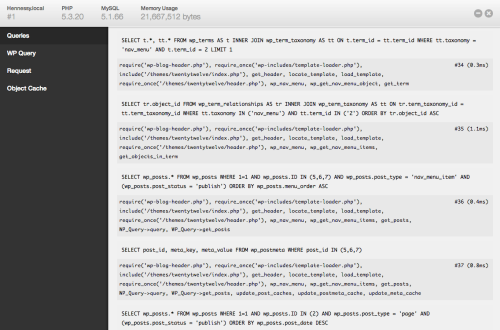 That is seven queries just to get the menu items. By adding pre_wp_nav_menu we would allow plugins to retrieve the whole menu HTML straight from a transient or object cache. Great addition man! Looking forward to using this in production.